Last Friday the Experimental Event took place at the Leiden University’s Faculty of Archaeology. Organized yearly by the Johan Picardt (Pre-)historic and Science Based Archaeology subgroup of L.A.S. Terra, the faculty’s study association, this year’s event was dedicated to the medieval period. The idea behind the event is to give an opportunity for students to learn about and try out different methods and approaches of experimental archaeology, a field of study that focuses on the reconstruction of ancient technologies and activities to generate and test hypotheses about how things where done in the past. Experimental archaeology also has a very important role in public outreach, because who doesn’t like reconstructions and to see first-hand or even have a go at how stuff was made in the past? A blacksmith and his apprentice was creating late medieval iron tools on-site. At the event there were a great number of artisans and experts on recreating crafts, food and music from the Middle Ages in north-western Europe: for example there was a blacksmith creating a series of late medieval iron tools, another craftsman was making pewter seals, medals and jewelry, and you could also try out and see examples of leather-work and experimental pyrography. All of the artisans were more than happy to share the details and experiences of their craft. Pewter, a malleable metal alloy, being melted on embers to create seals and jewelery. There were also tastings of medieval dishes, bread and beer brewed in in historic ceramic replicas, and the musicians of Muserie were preforming with traditional medieval instruments such as the hurdy-gurdy, livening up the atmosphere. Did you know hurdy-gurdies? They are a string and wheel the medieval and renaissance instrument that sounds like this. On more practical and hands-on matters, at the event you could learn different ways to weave baskets with reeds, as well as how to create wool yarn with a spindle, a technique that dates back to at least the Neolithic which was very widespread, as spindle whorls have been found in archaeological excavations around the world. The organizers also ran an experiment to build a miniature oven from mud. Overall the event was very interesting and entertaining, giving archaeology students a chance to engage with very different ways that medieval crafts and toolmaking can be made authentically in our days, which I believe is a good compliment for the Experimental Archaeology course that is an elective in the second year of the BA in Archaeology. Have you ever been to an event of this kind? If you would like to, in the Archaeon Museum Park close to Leiden you can live a similar experience of reenactment and experimental archaeology. ¡Hola! My name is Daniel and I’m a second year RMA student at the Faculty of Archaeology specializing in heritage. Besides my academic interests, which include history, tourism and museums, I enjoy photography, spending time in nature and drawing. Since arriving to Leiden back in the summer of 2017 I have been drawn by the history and heritage of this lovely university city. In this space I will be writing posts mainly about those topics, sharing interesting spots, art, museums, cultural events and little known stories of Leiden so you all can get to know the city a little better! 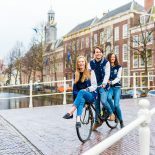 This entry was posted on April 13, 2019 by Daniel Salinas in Daniel, Festivals, Leiden, Living in Holland, My programme, Student Life, Study, Uncategorized and tagged archaeology, experimental, History, medieval, reenactment.